The smart cities of tomorrow will be increasingly powered and heated by the sun. But not all solar-generated power will come from solar panels located on buildings or in fields nearby. A lot of the energy will be passively collected by the buildings themselves. And thanks to increasingly intelligent designs, smart self-heating buildings are posed to have a bigger impact on the design of smart grids. What factors influence the amount of solar radiation that is available to keep buildings warm? Let’s take a closer look. Some incident radiation is absorbed by buildings’ exteriors and by interior surfaces that are exposed to sunlight. But not solar all energy comes from direct exposure to sunlight. Some of it, called diffuse radiation, is absorbed from radiant energy that is widely distributed in the atmosphere around a building. There is also reflected sunlight from nearby buildings, bodies of water, and even passing cars. Developers of Intelligent buildings are finding new ways to design and position buildings to maximize their ability to absorb and retain radiation. A growing number of software programs are available to help in the design of solar-efficient buildings. One company, Aurora Solar, offers software that remotely generates a report on how much solar radiation is available at virtually any building site in America. Today’s smarter buildings are designed to capture and hold more solar radiation during cold periods of the year. Conversely, they are designed with shades and exterior glass that reduce solar heating during hot months. During what times of the day is a building able to passively collect the most solar energy? Understanding these factors requires measuring levels of sunlight and solar radiation on a building site. 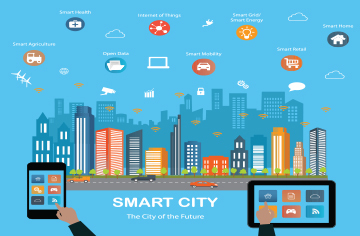 Yet as the move to smart cities evolves, a growing body of data is available on solar radiation in different cities and regions of the country. The result will be more efficient and flexible deployment of available electricity to where it is needed most in the grid. Stay Up to Date! Don’t miss our upcoming Microgrids Convergence Conference, which will explore the future intersection between microgrids, smart cities and advanced transportation.